Sometimes breakfast is too early and lunch is too late—or maybe you want a slice of roast beef with your waffles. And that, dear eater, is precisely why the dining deities reached down and delivered brunch unto us. In Missouri, these are our favorite spots to indulge in a delicious brunch. Hungry folks in Kansas City love to grab brunch at Succotash. They only serve breakfast and lunch, and they make all their specialties—like the local three-egg omelet—from the freshest, most-locally-produced ingredients available. Succotash loves to bring local producers to their own community. Half & Half keeps folks coming back for brunch with its top-tier coffee program and scratch made dishes. Favorites include their Clara Cakes (with marscapone and raspberry jam) and the sausage biscuit with scrambled eggs, aioli, and potatoes. Gailey's Breakfast Café, located in an historic former drug store, is a breakfast, lunch and brunch stalwart in Springfield. When you go, definitely try the Ozark benedict or Julia's burrito. They are a favorite, but you won't go wrong with anything on Gailey's menu. In St. Louis, the Southwest Diner injects a little southwestern spice into the local brunch scene. Start with some sopapillas for the table—these delicious little doughnuts dunk dreamily in the diner's rich coffee—then dive into the entrees. Breakfast, lunch, wherever your mood takes you. We recommend the Grits on Fire. One of the best brunch spots by day and a rockin' live music venue at night, Café Berlin's split personality keeps the citizens of Columbia happy and on their toes. When you go for brunch, try the Compost Pile—a slathered biscuit—or the Anonymous Tacos. Shack has a handful of locations in the state, and that's because one just wasn't enough to support all the love they get from the fine folks in Missouri. If you're gonna eat at Shack—and you know you are—you may as well go all in and order the Shack de Madame. You won't be disappointed. When you're visiting Branson and the Ozarks, brunch at the Farmhouse Restaurant is pretty much mandatory. It’s just the exact type of delicious, down-home cooking you want. Try the hearty Fisherman's Special. Back in KC, the Corner Restaurant specializes in brunch. They do it simple, they do it fresh and local, they do it from scratch, and they do it seven days a week. Try one of their specialties like chicken & waffles or the chorizo grit bowl. If it's a drinkin' brunch, order a Death in the Morning. 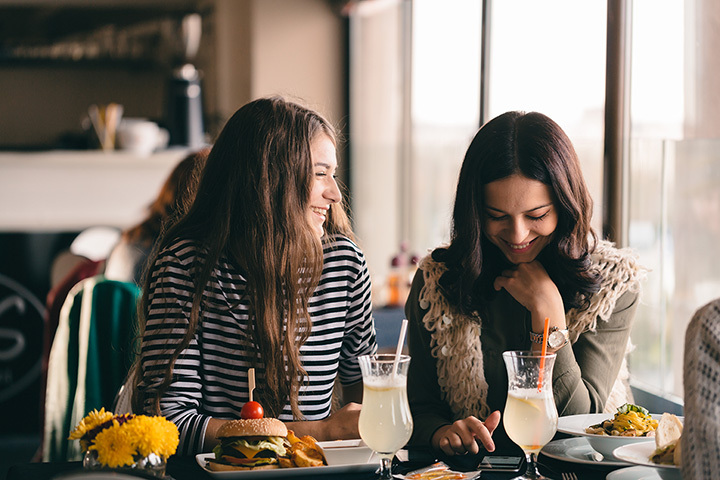 When you go out for brunch, you want to sit at a table with your companions, linger over coffee and maybe a newspaper, and order from a good variety of comforting breakfast and/or lunch dishes. And that's exactly what you can do in the state capital when you head over to Angelina's Café. The Ultimate Omelet is a force to be reckoned with. At the Mud House in St. Louis, they serve breakfast and lunch—i.e., brunch—all day, every day. Not only do they offer the kinds of rib-stickin' comfort foods that we Midwesterners love, like biscuits and gravy, but the Mud House also gives a nod to the Empire with an English breakfast and has a good selection of vegetarian options.